Mark pipes quickly and easily with pipe markers designed to meet ANSI/ASME pipe labeling requirements. We offer a large assortment of ready-made and customizable self-adhesive, snap-around, roll-form, and high-performance markers, plus many more. Visit our Pipe Markers Buying Guide, or use our Pipe Marker Finder below to identify the pipe markers that match your specific applications. Size Recommendations. The A13.1-2007 standard also makes recommendations as to the size of letter height and length of color field for various pipe diameters. These recommendations are shown in the table below. Seton markers, used properly with arrows and banding tape or arrow tape, meet or exceed the standard. If you do not have typical pipe marker needs or do not see your ideal wording, it is easy to customize with Seton. Specify the style, wording, size, color and if special symbols are required. Indicate flow direction, provide extra adhesion and extend the usable life of self-sticking markers. Meets ANSI/ASME A13.1-2015 standards when used with appropriate pipe markers. Indicate flow direction, provide extra adhesion and extend the usable life of self-sticking, transparent markers. Meets ANSI/ASME A13.1-2015 standards when used with appropriate pipe markers. Indicate flow direction, provide extra adhesion and extend the usable life of self-sticking, FBC™ System Compatible markers. Meets ANSI/ASME A13.1-2015 standards when used with CPVC Code™ Pipe Markers. Specially designed and tested, these self-adhesive, vinyl CPVC-Code pipe markers for nonpotable water contents will reduce damage and environmental stress cracks of Lubrizol CPVC pipes over time. Markers designed and tested to be FBC™ System Compatible with CPVC piping and include pictogram to denote nonpotable water. Meets ANSI/ASME A13.1-2015 standards when CPVC-Code™ Arrows-On-A-Roll Tape is used to indicate flow direction. These self-adhesive, vinyl CPVC-Code pipe markers are used with nonpotable water piping that need to be marked continuously; while designed and tested to be FBC™ System Compatible with CPVC pipes and fittings. Markers include pictogram to denote nonpotable water and a directional arrow to indicate flow direction of pipe contents. Meets ANSI/ASME A13.1-2015 standards. Specially designed and tested, these self-adhesive, indoor/outdoor grade vinyl CPVC-Code pipe markers will reduce damage and environmental stress cracks of Lubrizol CPVC pipes over time. Service temperature: -40℉ to 180℉. Meets ANSI/ASME A13.1-2015 standards when CPVC-Code™ Arrows-On-A-Roll Tape is used to indicate flow direction. Durable, self-adhesive, vinyl markers warn individuals about chemical hazards in your pipes. These easy to peel and stick in place markers feature GHS pictograms which meet OSHA 1910.1200. Meets ANSI/ASME A13.1-2015 standards when Arrows-On-A-Roll™ Tape is used to indicate flow direction. Self-Adhesive markers for up to 3/4" OD pipes containing hazardous contents, use perforated roll-form markers 3" x 3" Medical Gas Pipe Markers-On-A-Roll. Each marker include 4 lines of text plus directional flow arrows. Markers comply with CGA C-9 and NFPA 99C Standards. Convenient roll of 60 markers. Our Best Selling Pipe Marker! 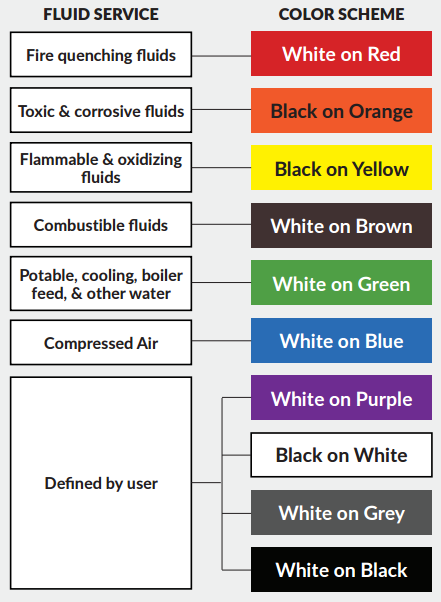 Durable, self-adhesive, vinyl markers commonly specified by engineers. Easy peel and stick installation. Ideal for dry, clean pipes. Service temperature: -40℉ to 180℉. Meets ANSI/ASME A13.1-2015 standards when Arrows-On-A-Roll™ Tape is used to indicate flow direction. Durable, self-adhesive, vinyl markers commonly specified by engineers. Easy peel and stick installation makes for ideal application to dry, clean pipes containing ammonia. Ideal for dry, clean pipes. Service temperature: -40℉ to 180℉. Meets ANSI/ASME A13.1-2015 standards when Arrows-On-A-Roll™ Tapes or Opti-Code™ Directional Arrows are used to indicate flow direction. Can be wrapped around pipes or used as individual markers. Perforated, self-adhesive vinyl with clear protective laminate offers additional durability. Pipe banding tapes are recommended for additional adhesion. Legend repeats 60 times on one 30’ roll. Markers do not need ASME A13.1 standards for length of color field or letter height. Clear, self-adhesive polyester coated with permanent acrylic resists tearing, heat and abrasion to prolong the markers’ lifespan . They are ideal for clean, dry surfaces and let the pipe color show through. Meets ANSI/ASME A13.1-2015 standards except color when Clear Arrows-On-A-Roll Tapes or Poly-Code™ Clear Directional Arrows are used to indicate flow direction. Tough and durable heavy-duty 5-mil self adhesive vinyl and is laminated for protection. Perforated arrows can indicate flow in either direction. 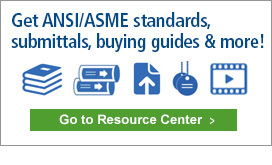 Meets ANSI/ASME A13.1-2015 standards. Comes in convenient rolls of 50 markers. Peel and stick orange, self-adhesive markers are supplied on cards and individually slit for easy use. Warn individuals about existing electrical lines in your facility. Use on control boxes, switches, circuit breakers. Markers conform to ANSI specifications. Warn employees of potential asbestos hazards with pre-coiled vinyl markers that snap into place without adhesive. Larger sizes require strap around markers with nylon ties. Both ideal for indoor pipes, including dirty, oily and greasy surfaces. Quickly identify asbestos or asbestos-free pipes and alert people in your facility with these 9"W x 2-1/4"H pressure-sensitive self-adhesive vinyl markers. Durable, self-adhesive vinyl comes in multiple markers for each card for added convenience. Works best on dry, clean pipes and is ideal for both indoor and outdoor use. All markers designed to meet ANSI specifications for background and letter colors and 2 sizes fully meet ANSI/ASME A13.1-2015 standards when Arrows-On-A-Roll™ Tape is used to indicate flow direction. Pre-coiled orange, vinyl markers simply snap into place around cable or conduit up to a 6” diameter. Use to warn individuals about existing electrical lines in your facility. Markers conform to ANSI specifications. Over-laminated, polyester wrap-around markers with a peel off adhesive strip provides superior durability and protection against chemicals, high humidity. Markers are ideal for dirty, greasy or rough surfaces and resist fading and curling even in the harshest environments and outdoor conditions. Arrows included on every marker. Meets ANSI/ASME A13.1-2015 standards. Warn individuals about dangerous materials running through your pipes. Ultra fade-resistant vinyl, these pipe markers are the ultimate choice for outdoor durability. Top of the line pressure-sensitive self-adhesive can withstand temperatures from -40℉ up to 180℉. Two 2 ¼” x 6 ¼” markers with detachable arrows can indicate flow in either direction. Continuous wording on self-adhesive vinyl markers for larger pipe sizes. No need to pre-clean pipes or use banding tapes as the marker adhere to itself. Easy to unroll and cut for quicker application; wording repeating 65 times on 30’ roll. Marker meets ANSI/ASME A13.1-2015 standards for length of color field. Self-adhesive vinyl adheres to itself for easy wrap-around marker installation. Simply peel the liner and wrap around the pipe allowing the wording to be visible to be visible from all angles. Arrows on every marker included to indicate flow direction and complies with ANSI/ASME A13.1-2015 standards. Self-adhesive polyester with clear laminate are chemical, abrasion and weather resistant to handle extreme industrial or harsh weather conditions. Apply to clean, dry pipes. Service temperature -40℉ to 230℉. Meets ANSI/ASME A13.1-2015 standards when Arrows-On-A-Roll™ Tapes or Xtreme-Code™ Self-Adhesive Directional Arrows are used to indicate flow direction. The A13.1-2015 standard makes recommendations as to the size of letter height and length of color field for various pipe diameters. These recommendations are shown in the table below. Seton pipe markers, when used properly with arrows and banding tape or arrow tape, meet or exceed the standard. Your pipe markers should be color-coded based on what they contain. Make sure you pay attention to regulations when selecting pipe markers so you can choose the right color schemes for your your pipe markers, depending on your applications. Call us for special project pricing! Identify pipe content, including acid, air, chilled or hot water, steam, condensate, oil, gas, hydrogen, oxygen, wastewater, and others with pipe labeling. Help protect workers using pipe markers with different legends in a variety of sizes and colors.